Hi-Q Oligo FucoidanTM - Low Molecular Fucoidan With the advanced biotechnology exclusively authorized by “The Taiwan Fisheries Research Institute (TFRI), the Executive Yuan Council of Agriculture (COA), Hi-Q Oligo Fucoidan TM is the health supplement made of “Fucoidan”,an natural extract mainly (Fucose) - a polysaccharide body from the premium graded, natural oceanic brown seaweed found in Taiwan. Under the use of “low molecular technology” to extract the purest and highest potency primarily (Fucoidan) in allow molecular weight fucoidan (500Da), we named this high quality “lowmolecular weight Fucoidan” as “Hi-Q Oligo Fucoidan TM ”, the best natural Fucoidan dietary supplement available in the market for your lifelong health. Hi-Q Oligo FucoidanTM is special in its composition of low molecular weight fucoidan and outstanding to general commercial fucoidan : The difference is Hi-Q has utilized the advance “low molecular technology” to extract the purest fucoidan from brown seaweed in its original macro molecules fucoidan (polysaccharide) to “low molecular weight fucoidan” (oligosaccharides)for better effective benefits and results. We highly recommended to take Hi-Q Oligo FucoidanTM consistently daily for your lifelong health and longevity. Hi-Q Oligo FucoidanTM - Low Molecular Fucoidan With the advanced biotechnology exclusively authorized by “The Taiwan Fisheries Research Institute (TFRI), the Executive Yuan Council of Agriculture (COA), Hi-Q Oligo FucoidanTM is the health supplement made of “Fucoidan”,an natural extract mainly (Fucose) - a polysaccharide body from the premium graded, natural oceanic brown seaweed found in Taiwan. 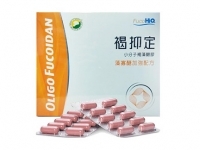 Under the use of “low molecular technology” to extract the purest and highest potency primarily (Fucoidan) in alow molecular weight fucoidan (500Da), we named this high quality “low molecular weight Fucoidan” as “Hi-Q Oligo FucoidanTM”, the best natural Fucoidan dietary supplement available in the market for your lifelong health. Hi-Q Oligo FucoidanTM is special in its composition of low molecular weight fucoidanand outstanding to general commercial fucoidan : The difference is Hi-Q hasutilized the advance “low molecular technology” to extract the purest fucoidanfrom brown seaweed in its original macromolecules fucoidan (polysaccharide) to “lowmolecular weight fucoidan” (oligosaccharides)for better effective benefits and results. We highly recommended to take Hi-Q Oligo FucoidanTM consistently daily for your lifelong health and longevity. Hi-Q Marine Biotech International Ltd. was established in 1998. Hi-Q stands for high quality products & services. Our marine biotech business consists of Ecological Re-circulating Aquaculture Technology (ERAT) & System (ERAS), and the Marine Biotech Health Product Series – low molecular Fucoidan. Hi-Q’s Marine Biotech Health Products Department –We have strong Research & Development (R&D) cooperation with the Taiwan government agencies – the Council of Agriculture (COA), TFRI and the foreign governments, the professionals in medical science, food science and health care for developing the best Fucoidan functional materials & ingredients from Taiwan, for natural health and skincare products. Hi-Q Oligo Fucoidan (Low Molecular weight (500Da) Fucoidan, a sulfated polysaccharide- mainly contains (fucose), extracted from natural marine brown seaweed for natural health care & skin care products.